Weekly Music Together® Preschool classes are 30 minutes long and include an artistically conceived flow of songs, nursery rhymes, instrumental jam sessions, fingerplays, and movement activities. The combination and types of activities are research-based and support children’s developing competence in tonality and rhythm. In addition, activities evolve from the child’s world and include vocal play, animal sounds, rhythm play, language play, and a good bit of genuine, silly fun. Classes are taught by a registered Music Together® teacher who is trained in music development and skilled in leading participatory music activity. Children bring the music home to their parents through the family CD and songbook. When you bring music into your preschooler’s life with Music Together, they enter a musically rich environment that welcomes their participation, however they choose to engage with it. With songs in a range of musical styles from lyrical to blues and world music to folk, Music Together stimulates and supports your three-, four-, or five-year-old’s growing musical creativity, enthusiasm, and skills. When your child is young, music has tremendous power to enhance, not only their love of music and the joy it brings, but also their overall development. 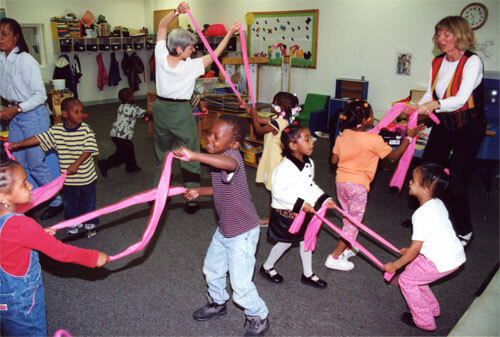 Just as music integrates mind, body, and emotions, music learning supports all learning® (PDF).